Picky Bars are the brain children of endurance wunderkinds Lauren Fleshman, Jesse Thomas, and Stephanie Rothstein. These yummy treats come in gluten-free and dairy-free varieties. An important aspect of this nutrition bar is the 4:1 ratio of carbohydrates to protein. Most of these bars are around 200 calories and have roughly 6g fat, 28g carbohydrate and 7g protein. The primary ingredients include dates, rice, chocolate, fruit, various nuts/seeds, seasoning, and oil (sunflower and/or canola). Lauren’s Mega-Nuts is the original bar and has a pretty diverse selection of ingredients. Nutless Wonder is free of tree nut and peanuts. You can eat this bar in any elementary school outing without fear of allergy exposure. All-In Almond has what it says, almonds as being the only nut present in this bar. This vegan bar uses agave as a sweetener. 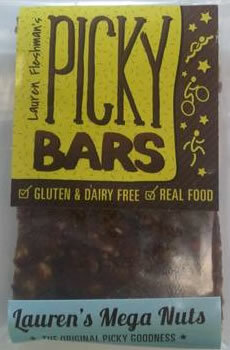 Picky Bars are clean burning fuels. They are well proportioned with regards to fat, carbohydrate, and protein. Bars are $3 each if you buy small numbers. Buy greater quantity and the prices go down. You can get them as low as $2 per bar if you stop by the Eugene store front to pick them up yourself.